Pelargonium capitatum is indigenous to South Africa and can be found in fynbos all along the coast of South Africa - from Lamberts bay to Kwazulu-Natal. 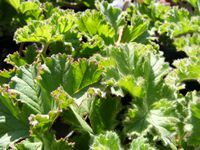 As with Pelargonium graveolens and certain other pelargoniums, Pelargonium capitatum is also known as rose-scented pelargonium. The name refers to the scent of the essential oil extracted from the plant. Pelargonium capitatum is a bushy, low-growing plant that can grow up to 100cm high and about 1.5 m wide. 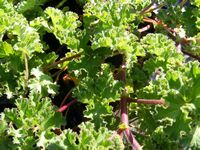 The color of the soft, sprawling and erect stems varies from green to red and the side branches can grow to a length of 0.6 m.
The stems and leaves, covered with long, soft glandular hairs of variable density, are sweetly scented when bruised. Pelargonium capitatum bears flowers that range from white through various shades of pink to purple. Although its preferred habitat is sand dunes, it will also do well in a sunny position on any neutral to alkaline soil. 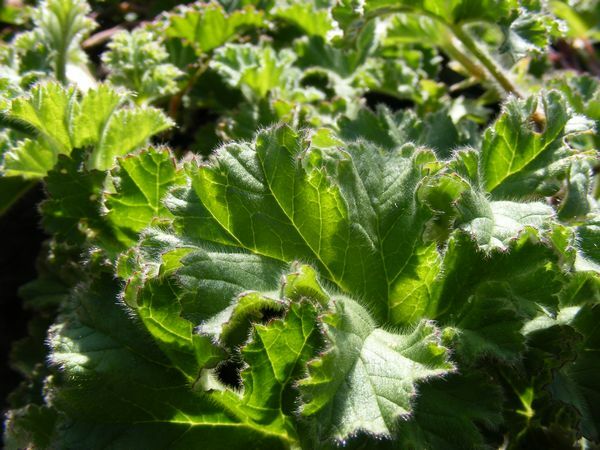 Pelargonium capitatum will tolerate temperatures down to about 0°c and need to be kept fairly dry in winter. They are tolerant to pruning - cut back hard in spring to encourage fresh growth. Pelargoniums can be propagated by cuttings in summer or be grown from seed in summer and early autumn. The above ground parts - harvest and use leaves as required. The whole plant is an aromatic, soothing, emollient and astringent herb with a rose-like aroma. A tea made from the leaves is an old remedy used by people from the Cape to treat kidney and bladder ailments, stomach cramps, nausea, vomiting, diarrhea and flatulence. Externally, the leaves can be rubbed to the hands to soothe calluses and scratches, and on heels to soften horny, cracked skin. Pelargonium capitatum leaves can be tied in a piece of muslin and used in the bath as a skin and wash treatment, which will also soothes rashes. The essential oil is used in aromatherapy and skin care. The leaves are used in pot-pourri.